Movies such as The Insider and Blood Diamonds have raised public awareness of these issues and while human rights are now on the corporate agenda and there to stay, they are managed largely in an ad hoc manner with little industry consensus on how to tackle the challenges they pose. Industry specific principles, for example The Voluntary Principles on Security and Human Rights. have all identified human rights obligations specific to private companies. A link to these sites can be found within resources. While these instruments are voluntary and therefore business friendly to entice participation the implementation in practice for managers without human rights experience is difficult as they often don’t meet the complex, varied and ever-changing needs of the business world. Businesses need mechanisms subtle enough to function in a complex system, yet simple enough to be used by managers with little or no human rights experience. All instruments have in common the attempt to define what exactly the human rights obligations of business are and to provide practical guidance in translating these obligations into activities. The human rights movement, unlike the environmental movement was relatively slow to engage with the business sector and for a long time both viewed each other with mutual suspicion and in some cases still do. 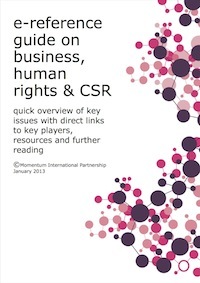 Momentum promotes the use of the human rights framework and believes that it has significant potential to act as an internationally recognised benchmark for corporate sustainability and responsibility activities. For more information on how we can assist you please go to services.